Deanna here back with another inspiration post for you. Today is my step-dad's birthday so this is the card I made for him. For my card, I started with a piece of Kraft card stock cut and folded to make a 4 1/4" X 5 1/2" portrait style card. Next I took some Tim Holtz Distress Water Color card stock and using Tumbled Glass and Mermaid Lagoon created my sky. I used Twisted Citron and Mowed Lawn for my grassy area. After inking it I lightly spritzed the water color card stock with a distress sprayer and using a paper towel blotted the paper. This helps create a distress look to the sky and grass. (See the little white areas on the card stock? That is a result of the spritzing and blotting it off). I used two different dies for my project. 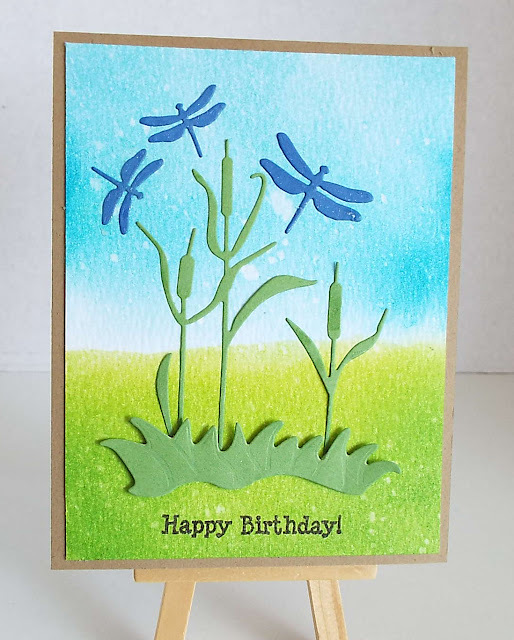 The first one is from Impression Obsession Cattail die for the cattails and dragon flies. Next I used the grass from the Yvonne Creations toad stool set.I die cut my images from regular colored card stock. Everything but the grass is adhered down directly to the card using some liquid adhesive. The grass is adhered with some foam tape and the Happy Birthday was stamped using some Memento Tuxedo Black ink. cool mix of the dies and I just love the background you did for them, he will LOVE it! WOW what a great idea Deanna! Simply beautiful! Lovely card with a gorgeous background. Very pretty. Love the blue dragonflies against the blue sky. Cute card, Deanna! Such sweet colors, too! What a sweet card this is! The ink blending in the background came out awesome and I love the blue dragonflies! !